To answer @maddow’s question, no I was not satisfied with what I heard from AG nominee Barr. We needed to hear a strong commitment to releasing the findings of the Mueller report to the public. Instead we heard equivocation. Rep. Adam Schiff: "The Attorney General did a grave disservice to the country by misrepresenting significant parts of the Mueller report by attempting to put a positive spin for the president on the Special Counsel's findings." Sen. Richard Blumenthal: "We need to see the Mueller Report and not the Barr Report. The American people paid for the Mueller Report and they deserve to know all of the findings and evidence." Robert Mueller's report into Russia's role in the 2016 US presidential election has been released. Still trying to make sense of the 448-page Mueller report? Watch the live webcast discussion on the report's findings, its implications, and what happens next. Leader McConnell just blocked a resolution that called for the release of the full Mueller report. It passed the House 420-0. The American people deserve to see Special Counsel Mueller’s findings in his own words. Republicans must not hide this report. Why didn’t the Attorney General want anyone to know the Mueller Report was over 300 pages during the 2 days when he read it and shared his own view of the obstruction evidence that went beyond Mueller’s findings? --The American people have access to the full report. --Congress has unfiltered access to all findings. We can't afford to settle for anything less. William Barr is qualified, but like Whitaker, his chief appeal to Trump may be his criticism of Mueller and his receptivity to investigating POTUS’s rivals. Barr must pledge to allow Mueller’s work to continue unimpeded and to allow him to report his findings to the public. It's not a coincidence that Barr's letter was released on a Friday afternoon. Prepare for Trump and his enablers to downplay and bury whatever comes next. 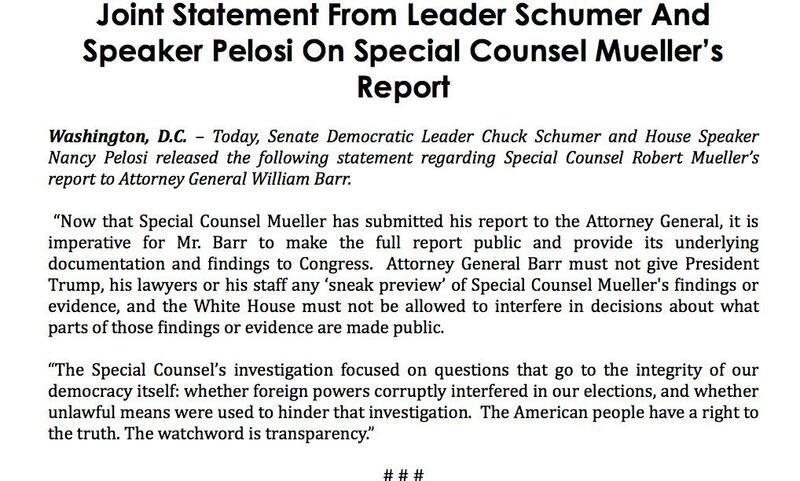 We must demand to see the full report, and Congress must have access to all of Mueller's findings. Period.